We teamed up with Fora to deliver their vision for new co-working spaces. Set to create a new standard in the industry with a premium hotel-style service which creates a retro, yet modern design with innovative technology to support their residents. We helped them provide a new seven floor co-working space that includes everything from conference rooms and bike storage, to showers and a restaurant. This is topped off with all the normal agile working spaces you'd expect from leaders in co-working. The entrance to Fora's Brandon House space was sought to replicate the feeling of a boutique hotel, with a concierge service for their residents and guests. The space has casual working spaces and a cafe where guests can help themselves to coffee and refreshment and work in a semi-private and uninterrupted cafe atmosphere. No more asking the waiter for WiFi at their local cafe! The cafe-style reception features bespoke joinery and a hard-wearing polished concrete floor to finish off the industrial look, which also complements the local surrounds in Borough. This is paired with the exposed services to elevate the visible ceiling and give the reception a heightened sense of space. 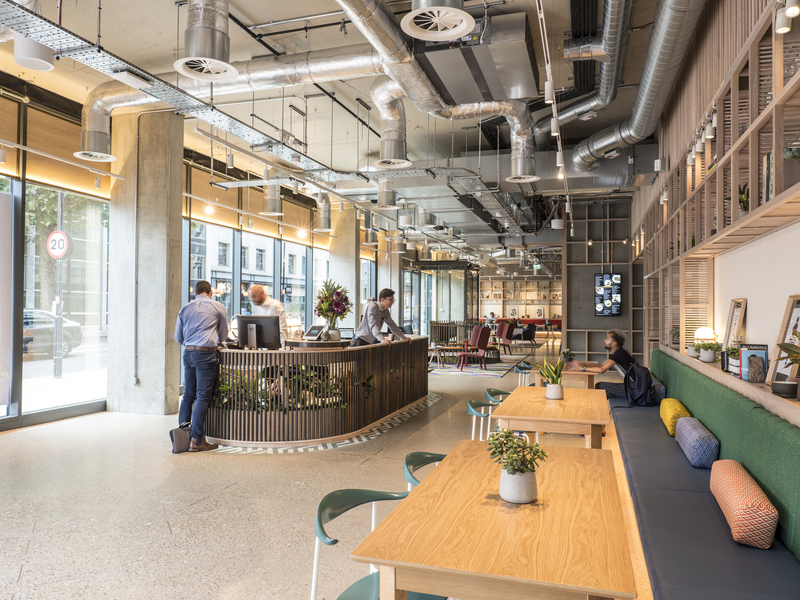 This co-working space well and truly reflects the natural environment, creating a haven away from the bustle of Borough High Street. Guests are greeted with an abundance of natural tones and finishes in the reception; from the wooden joinery to the dark blue and green cushions. 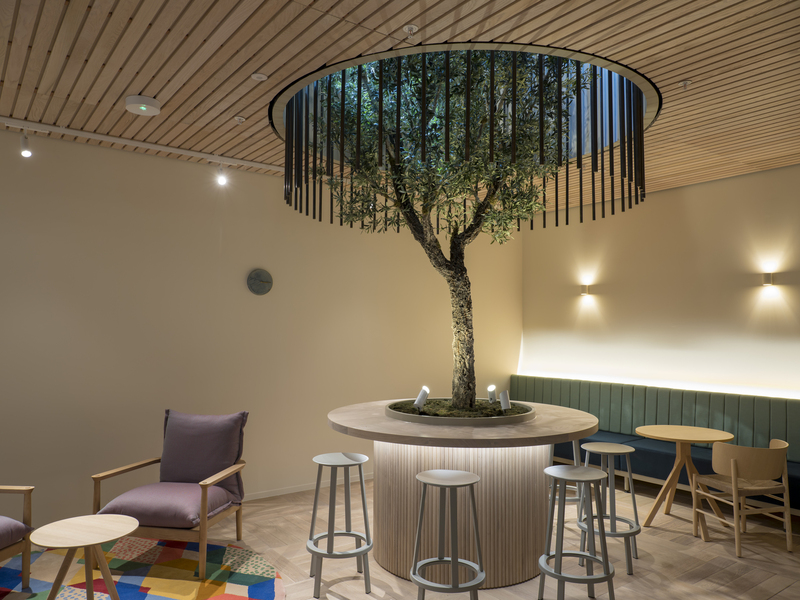 As they move to the lower ground floor, they're treated to a stunning double-height centerpiece; a tree that rises through the chandelier void to the ground floor. This creates a focal point for the casual working area, which complements the detailed joinery and high-end finishes that've been used throughout the project. Besides, where else in London can you work in front of a tree rising through the ceiling? 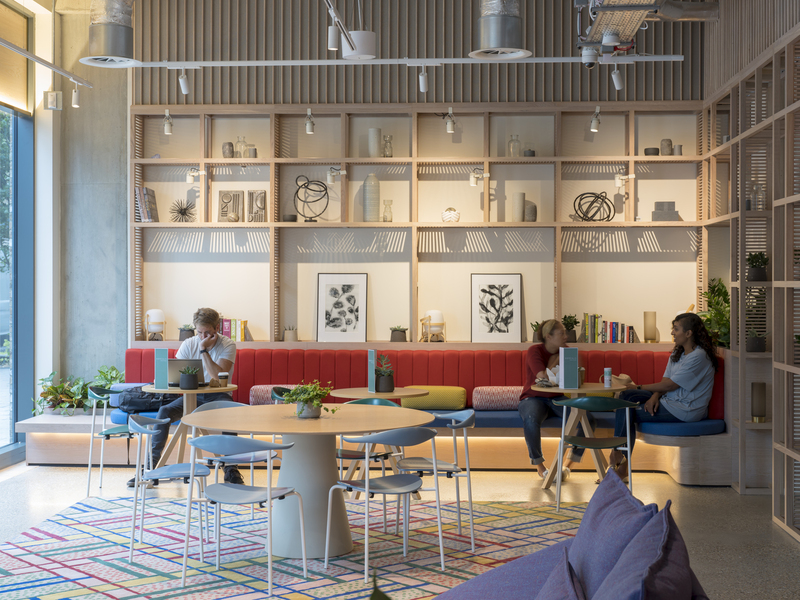 The mix of recycled material finishes, biophilia and wellbeing initiatives helped us achieve a BREEAM Excellent rating. Often co-working spaces are used by smaller businesses to quickly gain access to a dedicated, centrally-located meeting space. This means a variety of meeting spaces are incredibly important for Fora's clientele. To ensure the space is fully utilised, and to avoid any meeting clashes, all meeting and office spaces are setup with wall-mounted iPads for booking management. While this space may look like a trendy cafe with booth seating, it's actually meticulously designed for its setting. There's glass partitioning between each booth to boost privacy and reduce noise transfer, and the booths are fitted with a white noise filter to minimise any potential disruption when neighbouring booths are being used simultaneously. This was a large project that was delivered under a tight 36 week programme, with only one week pre-construction to kick things off before the build began. We ensured procurement, design and construction were simultaneously working side-by-side to ensure the programme was met and delivered within the client's budget. We organised for weekly full-day design workshops to quickly sign off drawings and samples, ensuring the momentum of the project was maintained. 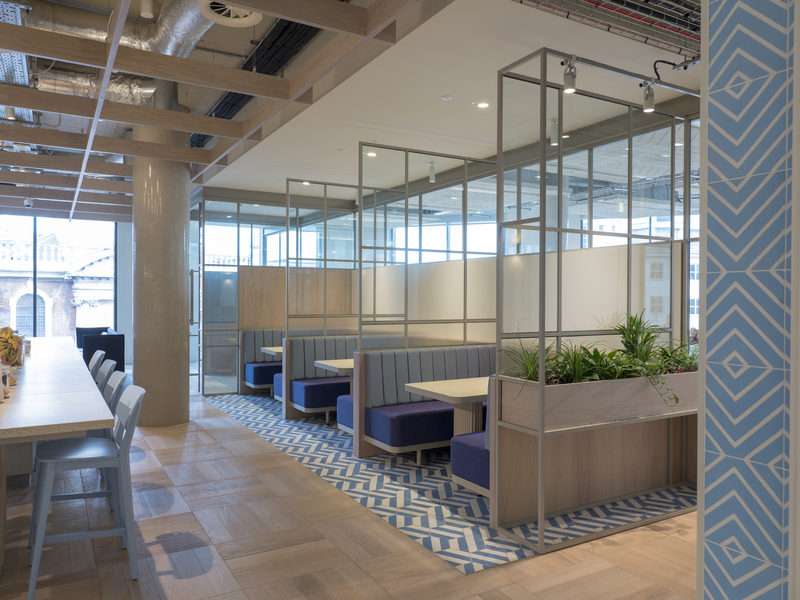 Due to the level of architectural detail and desired finishes, we also organised for weekly cost-control meetings to capture cost variations - making sure that Fora was fully involved in the development of their latest space.